If you have heavy-duty storage needs, a RAID (Redundant Array of Independent Disks) is the most cost-effective, mind-easing solution, though it can be a major pain to set up. A RAID is two or more hard drives linked together to function as a single storage device, providing greater capacity, better performance, and automated backups (depending on how it’s configured). You can build a RAID yourself or buy a preconfigured one. RAIDs come in different levels. In a striped array (RAID level 0), multiple drives work in parallel to eke out the best possible performance and provide a combined storage capacity (good for video production); however, this type of RAID provides no backup protection-you’ll lose all your data if one disk fails. A mirrored array (RAID level 1) provides very fast read times (it can read multiple drives at once) and real-time backup; it writes the same data across all disks simultaneously, so if one goes down, nothing is lost. But your total capacity is half the amount of the total capacity of all the drives. (For example, if you have a pair of 500GB drives in a RAID 1, you get only 500GB of total storage.) RAID level 5 uses parity, which provides data redundancy and better storage capabilities than RAID 1’s plain mirroring, splitting data across three or more disks, so if one goes down, your files are re-created from the remaining disks. Drive Enclosure People who want to configure their own RAIDs will find enclosures that provide anywhere from two empty drive bays to more than eight. When you’re selecting hard-drive mechanisms to fill the bays, use identical capacities and rotation speeds. If you can’t afford a moment of downtime, look for an enclosure that supports hot swapping, which lets you replace a drive without powering down. 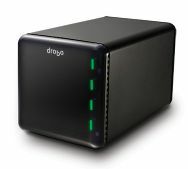 You can also choose to buy a configured desktop RAID with preinstalled drives. You’ll find double-drive arrays that offer up to 4TB of storage (they’re generally RAID 0 or RAID 1). The disadvantage to these RAIDs is that they sometimes use cases that don’t allow for convenient drive swaps. Connectivity Desktop RAIDs offer one or a combination of the usual connectivity options: USB 2.0, FireWire 400, FireWire 800, and eSATA. Since performance is usually the motivation for setting up a RAID, steer toward FireWire (FireWire 800 if your Mac supports it); consider getting an eSATA RAID and adding a port to your Mac Pro with an eSATA PCI, PCIe, or PCI-X card; or use an ExpressCard with a MacBook Pro.